For this month's piece, Joan Ogwumike, APRA-IL member and volunteer, interviews Carrick Davis of the Wisconsin Foundation & Alumni Association. Carrick Davis is a Senior Prospect Development Analyst in the Research & Prospect Management team at the Wisconsin Foundation & Alumni Association. He is responsible for supporting twenty development officers in prospect development, portfolio and pipeline management, and ad hoc analytics projects. His areas of specialty include relationship management, data mining, and applying data visualization techniques. A regular speaker at Apra International and chapter conferences, Carrick also serves on the board of Apra Wisconsin. Carrick has served as a data analyst in a number of non-profit industries, including economic development and transportation policy. Immediately before coming to WFAA, Carrick was a data and research analyst at Beloit College, his alma mater, where he earned Bachelor of Arts degrees in Sociology and Health Care Economics & Policy. He holds a Master’s degree in Urban Planning from the University of Michigan. Carrick: I’ve held a number of roles in various industries before I found myself in prospect development. The thread that I can string through all my positions is a focus and commitment to promote social good. I have a strong commitment to reducing inequality, and I believe education is a critical element of that work. I get satisfaction from knowing that my work in prospect management and analytics is improving educational access to a world-class institution through scholarships and student support. I also like that the field is flexible and continually evolving. There are many opportunities to innovate and try new and entrepreneurial approaches to solve prospect management problems. This is an industry that encourages pushing the boundaries of how data and information are used. I love the idea that I’m working on something that may have never been attempted before. Carrick: Seven years ago I got my first job in prospect development after graduate school, when I returned to my undergraduate alma mater to work in the External Affairs office. At that time, my only exposure to the field had been what I’d seen in the job description. My Prospect Researcher role demanded technical literacy (finding, confirming, synthesizing and storing information), communicating that knowledge in a way that development officers can use, and a commitment to using that data in new ways to further the organization’s mission. I was drawn to finding ways to quantify largely abstract qualitative concepts like “engagement” or "affinity”. I found that there was a limit to the amount of data inferences I could make given the small alumni base. I moved to Madison to take a position at Wisconsin Foundation & Alumni Association, in part because I would have a larger pool of alumni to work with. In the last four years at WFAA, I’ve had the privilege to work with top-notch fundraisers and data professionals. I like to think of my niche in the organization as nestled between prospect development, information technology, and development. My tenure at WFAA has been full of learning and contributing to a world-class public institution, for which I am deeply grateful. APRA-IL: Could you tell us one perception people have about professionals in Prospect Development? What's the truth? Carrick: I think there’s a misconception in the greater development community that prospect development professionals are shy, introverted and prefer to work in the back office. Prospect development, as a field, used to be focused on qualitative prospect research. Those researchers often came from librarianship – which is perhaps where this perception comes from, feeding off antiquated stereotypes of librarians being shy and introverted. Over the last twenty years, the industry integrated more sophisticated data warehousing and analytics into the world of prospect development. Prospect Development professionals now spend much of their time communicating about data to influence the actions of their development colleagues. Armed with these skills, prospect development professionals enjoy stronger partnerships with leadership that guide development strategy. While we are not frontline fundraisers, we are now sitting at the highest levels of the development strategy table, data-informed recommendations for our organization’s continued successes. Carrick: Cultivate relationships with frontline fundraisers. Ask questions that will help you understand their needs as fundraisers. The better you know how they make choices, work, and feel motivated, the better you’ll be able to support them. A great deal of prospect development is centered on providing information and counsel to help development directors make decisions about which prospects to prioritize. By showing that you are interested in their work and both the art and science of fundraising, development directors will trust that you’re providing recommendations that align with their needs and priorities. At the end of the day, Prospect Development supports Development Directors with data, information and strategic council. When you can approach a situation knowing how your Development Director thinks, your odds of success for your mission increases dramatically. This will also increase your job satisfaction, knowing your guidance is valued and utilized. We’ve recently started working with the Corporate and Foundation Relations (CFR) office. However, up until this point my focus has been researching individuals, not organizations. I want to be helpful for this office but I’m not even sure where to start doing research or what to provide to my CFR development officers. They mention that they could use some profiles and leads for some projects. Another gift officer mentioned looking into contacts at a local big corporation. How do you suggest I begin tackling this shift in my work? Corporate and foundation research can be very tricky. It’s often a topic not talked about as much as other areas of prospect research. But there’s a lot of potential work that you can do in this area. Plus it’s one of my favorite areas about prospect research that I talk about! Corporations and foundations are often handled within the same development officer department but the prospect research strategies can be very different based on the information available. A common place to start exploring foundations is with their 990 forms. The 990 form is a required filing with the IRS for all foundations. Helpful information that can be found in these forms are things like board of directors, foundation assets, and a list of that year’s dispersed gifts including the amount and the receiving organization. There are some great paid websites out there that have searchable information and 990 forms like Foundation Search and Foundation Center. If you’re constrained by your budget and don’t work at a higher education institution, your local library may have a subscription you can use. Luckily, we aren’t limited to subscription services or the hope of access through local libraries. Free options include Guidestar, which provides 3 years of 990 forms and the Charitable Bureau of Statistics which also provides some 990 forms. It is important to note across all of these services that there are lag times in the availability of current 990s forms from the IRS. It is typical to have the most current filing be two years old. Researching for corporations is a bit more complicated since they do not have 990 filings unless they also have a foundation. In most cases, they won’t have a foundation and so you’ll have to rely on other financial filings to analyze their potential. If the company is publically trade, they will have financial statements that they are legally required to make available. However, if the corporation is held privately, it gets trickier. You’ll have to rely more on personal connections through your fundraisers or donors to glean information on the corporation’s interest and capacity as well as researching the latest news regarding the company’s recent business dealings. If you’re trying to maximize your time, look into websites that help aggregate information like Dun & Bradstreet, Crain’s, etc. to provide you with a summary of relevant news. Now that you know where you’ll begin to look for information to provide to your CFR development officers, it’s important to consider what information is important to present it to them in a profile. A few key areas that you will want to include are giving (to your organization or to a similar organization), mission statement, and financial position if possible, and key players in the organization. For foundations these critical elements can be found on the 990 forms. Play close attention to the mission statement if they have one. This may help you determine if the foundation would be interested in your work. Spend some time reviewing the gifts over the last three years to get a sense of what nonprofits they support, is the giving consistent, and is their giving geographically specific? For corporations, you will be interested in answering similar questions such as what their funding interests are, their geographic preferences, and the eligibility of your organization for their funding opportunities. Present the information as you would with an individual profile and provide a rating. Ultimately, your assessment should be an integral part of your report to development officers and should help drive their strategy. So that rating…how do you rate an organization? Like individual ratings, each nonprofit has their own way of handling it. Some nonprofits handle CFR ratings by basing them on the yearly giving to a similar organization while others may base their rating on past giving. If your institution hasn’t come up with a rating for organizations, you may want to work with the CFR team to come up with one that works with your nonprofit’s needs and makes sense to the CFR team. In addition to creating ratings, the CFR team may also need assistance is developing new prospect leads to support a certain project, institute, or program. This, like finding new major gift donors, is very time consuming but is simple and straight forward. You will need to begin building a list using the same strategies outlined above but on a larger scale. This is where the paid websites are useful. Not only do they have a wealth of data on the giving of foundations and some corporations, but they also provide search functions that help focus and refine your search. Guidestar for example has filters like geography or name searches that can help narrow down the number of organizations to review from their 990 forms. While this is a project that will be have a broad focus it is still important to remember to limit how deep you go into any given foundation or company at this stage since you have a lot of ground to cover. As a way to manage and track your findings, one suggestion would be to keep a spreadsheet containing information about giving guidelines, application requirements and dates, and why they are included on the list for each new foundation/corporation you research. This will help track those you have identified and a potential program or initiative that they could fund. A key strategy for identifying new leads for CFR is finding connections to an organization through your current board members or donors. As we know, personal connections can be a critical part of fundraising. You are looking for a champion of your cause so start with your current champions and work outwards! The first place I would look is in your own database for business information. This may not be the most up-to-date information but it’s a good starting place. Also review your current board and see if anyone might be at the target company or an affiliated one. There are some services that do the linking between board members and other affiliated person with organizations like Rel Sci or Prospect Visual that makes it easier and saves time but you can still do this without these paid services. Reviewing LinkedIn and company websites for higher education organizations has an advantage since they can filter or search on degree from their institution. Non-higher education organizations may have to be more creative in how to use these search functions to determine who to reach out to. The challenges for prospect researchers in the corporate and foundation world are significant but hopefully you have been given a starting point to begin tackling them! Narrator: Welcome to Ordinary University, small town USA! Today we have a unique challenge and frontier to explore! Today we begin the challenge of making the perfect research match for a new major gifts officer for OU’s advancement office. This shop is a bold pioneer in attempting to match the skills and strengths of researchers to their gift officers. With the addition of a new officer, the need to find his perfect match is imperative to the success of building a new portfolio and garnering large new gifts. Let’s welcome our three competitors Veronica, Xavier, and Melissa to Match Makers: The Prospect Development Edition! Over the coming weeks we will be introduced to each competitor and be able to witness the strengths that they would bring to their partnership with our gift officer. Each researcher will be tested by a series of research request challenges to analyze their skills and compatibility with our new major gift officer. Their approach and the final result given to our gift officer will be analyzed for its usability, relevancy, and other preferred skills deemed by our gift officer as optimal for his perfect researcher match. Now that we have identified our three competitors, let’s switch gears and introduce Jared, our new major gifts officer. Jared what brought you to this position? We are so glad you have allowed us to accompany you on this unique journey. Now that we know you are well versed in the art of “schmoozing”. Let’s see how well you can schmooze into the hearts of our readers and the three researchers competing to be your perfect research match! We will follow Jared and the researchers over the course of five research challenges and at the end Jared will decide who will be his perfect researcher match. We hope you will join us next week on Match Markers: The Prospect Development Edition when Jared meets his potential matches for the first time and they begin their first challenge! Some of our gift officers are super suspicious of our capacity ratings. They keep saying that they know Prospect A has a lot of stock and family inheritance but our ratings are too low! Or they say that they know that Prospect B owns a vacation home in Italy. I check into their suggestions but I often come up with very little information. They complain about how we don’t give them the net worth of their prospects. Sometimes they complain that they are too high as well. I can’t seem to win! What do I do to convince them to trust the ratings that I’m giving them? Capacity ratings are the bread and butter of the prospect researcher’s trade. However, there’s a lot of confusion about what they actually mean and how they are generated. A standard definition is that it’s an estimate of a prospect’s potential giving based on their identified assets. Some shops have a cardinal role of taking 5% of identified assets; others may use a prospect’s past philanthropic giving as a guide. There’s a lot of different ways of calculating capacity ratings but I think the overall theme is that they are conservative estimates. Prospects may hold wealth in a lot of ways that aren’t publically available. Often times the wealthier the prospect, the more likely they hold their wealth in places that aren’t publically available. We don’t have access to bank accounts so there is not a sure way of knowing a prospect’s actual capacity. Sometimes, we find great philanthropic giving but few hard assets, which may explain why some think the ratings are too high. As a result, that’s why we talk about capacity ratings, rather than net worth. This allows us to provide some way for gift officers to plan strategies and prioritize their prospects when doing qualification work. All of that is understandable to those of us who work within prospect research but communicating our limitations to gift officers can be hard. When confronted with questions of the validity and usefulness of capacity ratings by gift officers, your course of action should be one of education and collaboration. In addition to understanding the logic and feasibility of our work, gift officers need to understand that they also have a role in creating the prospect’s capacity rating. While we know as researchers that a capacity rating is just a jumping off point; sometimes it’s lost that creating a rating is a dynamic process that requires an exchange of information from both the gift officer and the prospect researcher. In that process, you want to build gift officer’s understanding of what you are able to provide for them as well as to set the precedence of bringing back helpful information and sharing it with you to improve the assessment of the prospect. Prospect researchers provide a number based on the information we have, the gift officers are the ones meeting with prospects and the opportunity to glean additional information. They will see the watch that they wear, the places they vacation, the houses they live in, etc. and should use these observations to form their own judgements as to the wealth of the individual. In the exchange of information with gift officers, you may not find anything concrete but you might still gain useful information that you didn’t have before. For example, you may be able to search property listings in the area of Italy disclosed by the gift officer to see estimated prices of houses. An extra step that I have found beneficial, if you have the time and support from your fundraising leadership is to run an informational training on capacity ratings and validation theory. These “lunch and learn” sessions provide a constructive format for gift officer’s questions and allows for a conversation on how they can be helpful in creating a capacity rating by sharing information. A good example to use when showing gift officers how the availability of data can affect ratings and our assessment is philanthropic giving. Pick one or two well-known donors to your organization, one with a lot of public giving and one we know has the capacity but does not publicize their gifts. Briefly run through your process of researching these prospects’ giving and compare the search results with them. You should be able to show the difference in your process with someone who has a lot of information available and someone who does not. Building into your presentation instances where information provided by gift officers fueled deeper researcher and resulted in a more accurate rating also drives home your point. Another approach used by some shops to settle disagreements between prospect researchers and gift officers is to create two distinct ratings for each prospect, one rating from prospect research and one from the gift officer. The thought behind this solution is that each rating allows for a different view or approach to the assessment of a prospect’s capacity. For example, a research rating could look at a prospect’s lifetime capacity and not just over the next five years. While the gift officer’s rating could specific to what they believe that prospect’s next gift could be. Each of these ratings could also take into consideration aspects of inclination such as affinity to your organization. In the end, you have to consider how your shop operates and what would best help move your gift officers forward in making solicitations. There is no one size fits all but the key is to collaborate with the fundraiser. Remind them that capacity ratings are a great starting place but they aren’t concrete and can change based on their estimation or subsequent meetings with the prospect. Continuing to educate them on how we work and being open to discussion and collaborating will aid you tremendously in building a trusting working relationship with your gift officers. For this month's piece, Joan Ogwumike, APRA-IL member and volunteer, interviews Marissa Todd of the University of Central Missouri. Marissa Todd is currently the Director of Prospect Management and Research at the University of Central Missouri in Warrensburg. She has been working in non-profit fundraising for over a decade and has done just about every job in an advancement shop. Marissa has been dabbling in prospect development since 2008 but didn’t join APRA until June 2014 when she attended her first conference that summer. It was at that conference where she really found her passion for all things prospect development! Marissa earned her BA and JD from the University of Missouri and an MBA from Stephens College. In her free time, Marissa loves to hang out with her husband, Michael, and their two cats, Artie and Faurot; volunteer; and watch football (Go Tigers and Chiefs! ), hockey, college basketball – really almost any sport on a screen will occupy her attention. Todd: Prospect Development has a huge impact on engagement and philanthropy. The specific audience at my organization is all faculty, staff, and volunteers who engage with our constituents in order to create a meaningful relationship with our institution. That could mean anything from speaking to students or making a major gift. Through my work, I can provide insight to this audience to help them identify the right constituents for their particular need (giving, advisory board, etc.) and offer strategic direction to move these relationships forward. APRA-IL: Describe your motivations in this field, and what keeps you engaged. Todd: The constant learning in our field really keeps me motivated. I am always learning new process and techniques. The nature of our work - working with people and building relationships - means every day is different and offers new opportunities. I've been fortunate to work at organizations that are building out prospect development programs, which has been really amazing and a great opportunity to learn and grow. APRA-IL: What is next for you? Is there anything you would like to accomplish or challenge? Todd: Right now I'm in year two of building out a relationship management and research shop at the University of Central Missouri. I want to finish building this out to include a principal gifts program. We just launched a new strategic plan in July 2016, Transformation 2025, and I'm anxious to see how the prospect development shop helps shape that success. APRA-IL: What advice would you give a new professional in the field of Prospect Development? Todd: Join APRA. Going to that first APRA conference in 2014 was life changing for me. This community is so inviting and collaborative. You can learn so much from your colleagues so take advantage of membership and all the awesome things that come with it. Also - don't be afraid to advocate for your shop. Some managers understand the impact of prospect development; others inherit the program or just think they probably should have one, but don't really understand the value. Take every opportunity to prove your value and speak up about your impact. As a prospect researcher, I’m expected to put together a bunch of reports on our prospect pool and major gift donors on a regular basis. I work with a lot of data in donor records to help enhance my profiles and other prospect researcher. But the data quality isn’t as good as I was hoping. There’s stuff that’s missing or just plain wrong in contact reports, proposals, and so much more. And the worst part, it’s not even my data. How do I work to get better data into our system without ending up doing it all myself? You’ve hit upon a major difficulty that anyone who deals with data has faced. We don’t want any data; we want good data. If bad data is put into a system, all you’ll get is bad data from the system. In other words “Garbage in, garbage out” We need to have good data in our database in order to do the great work. However, what exactly is “good” data? What does “good” data look like in our database? How do we ensure we are entering “good” data into our systems? These are really important and sometimes hard questions to answer but are crucial conversations to have within your office. Ideally, the natural result of these conversations would be the creation of an office guideline for data entry and quality control thus ensuring that everyone has a shared understand and expectation of your data and its quality when retrieved through reporting. During these conversations, it’s important to remember that you’re aiming for prudent policies not perfect ones. A good starting point when developing policies or reviewing your current ones is, contact reports. What does the content look like and how are people entering it? For some institutions, it’s a decent summary of the encounter with the donor and it is filed in a timely manner. A decent summary could mean 1-3 sentences while another shop could require several paragraphs. A timely manner could mean within a week of the contact or within a month. It all depends on the institution and what your shop can maintain over a long period of time and honestly, what is actually useful in the ability to raise more funds! Whatever you come up with, it’s important that your institution create concrete definitions, document them and stick to them! People need consistency in data and policies for them to be effective! The next step is disseminating the knowledge. People need to be trained on what is expected of them. Having the documentation is key and can be useful as a takeaway when onboarding new staff. I frequently held trainings with new gift officers and other staff about how to enter data correctly and it was important to remember that some gift officers may outsource their data entry to their administrative staff so don’t forget to include them in any trainings! One hazard you have to watch for is that you don’t want to be the one who ends up entering people’s data for them. Previously, Dear Analyst 6 discussed this with respect to proposal data. This is very tempting to do. After all, you work with data all day and know how it should be. But this won’t help the situation. People won’t learn how to do it correctly if they aren’t a) required to enter their own data or b) have to correct it when it is wrong. We don’t want gift officers to rely on us to enter data. Some organizations do require their prospect researchers to be responsible for entering proposal data but if it’s not part of your responsibilities already, you probably don’t want to make it one. While training and documentation are essential, they alone are not enough. Managers must make good data a priority. They must hold people responsible for having their data up to date. Often times contact reports and proposals can be tied to performance metrics so there is an added incentive to have this information up to date in the system. There must also be a way to review the information to see if it is being entered correctly as well. Otherwise, you won’t know if the data is being entered correctly. Reports and audits are useful to check whether data is being entered correctly. Finally, it is important to be a model of good data in your institution. Prospect Research needs to set an example to others about good data in the system. Make sure any data that your department is directly responsible for is correct. For instance, make sure to upload research profiles in a timely manner. If there are mistakes, fix them. Keep your prospect ratings up to date based on recent research. These are just a few things to help in obtaining good data. We’d love to hear how your organizations manage this process. 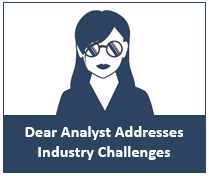 Let us know at Dear Analyst. As my term as board secretary comes to a close, I’m thankful for the other members of APRA-Illinois that I’ve been privileged to work with. This year I am thankful, as I am every year, for the amazing work done by the APRA-IL volunteers! Our chapter has amazing members willing to put forth the extra effort to bring great programming, resources, and collegiality to our professional field. I am thankful for a healthy operating budget and the day off to watch the Cubs victory parade! As a development professional who conducts research for prospective individuals and foundations, I am very thankful for current annual reports and 990 forms. I am also thankful for the availability of IRS 990 Forms. There’s so much information on those documents that can tell you so much about the organization, especially when there is not a lot on their website. I’m also thankful for all the support staff that make our work possible. Our support staff updates records based on our work with obituaries; they help with the formatting of our research products. They provide us data and so much more. Thanks to you all! From all the members of APRA IL, have a happy and healthy Thanksgiving! I’m having some difficulty with some of the gift officers I’m supposed to support. Some of the gift officers are outsourcing their research to their administrative assistants and secretaries. If it’s a simple bio request, I’m okay with them reaching out to their admins. However if it’s more complicated, like a rating capacity or an analysis of their philanthropic giving, they should be talking to me. When I ask why they are doing this, I’m told that they needed it quickly and couldn’t wait for our research department turnaround time. What do I do? I have skills and tools cultivated for this purpose. It’s true that I do ask for some lead times. How do I explain to them that they should direct these requests to me? That is a tricky issue. We want to strike a balance between simple searches and the intensive, specialized work we do as researchers. As noted in Dear Analyst 1, we have the challenge of explaining to people that our work is more than just Googling information. We have access to a series of specialized tools that help augment our research, often not available to the public. We can judge data to be reliable or more importantly, know when we don’t know if it is reliable. For instance, we have the judgment to know if we have the right Jane Smith in Omaha, Nebraska or know when our knowledge is going to be limited about her. We compare sources to ensure that our data is good, or as good as we can make it. These are not skills to be taken lightly. When research is outsourced to other departments, the chances of mistakes or misunderstandings can rise. We have to be careful not to point fingers when mistakes are made (that’s not how you foster healthy and positive relationships with colleagues) but errors can have big consequences for an organization. The last thing we want is a gift officer to have bad information at a prospect meeting! But it’s also important that we as researchers have time to do our work. Many of us work with several gift officers; some of us are sole researchers. Lead times are important to help us with time management so we can produce timely and accurate work. It’s again a tricky balance. So how do we communicate all this to our gift officers? There’s a couple of ways of handling the situation. It may be worthwhile to listen to gift officers to understand why they feel the need to obtain research help outside of the research department. Hear them out. You can then gently use the opportunity to explain that doing research outside of the research department has an impact on the organization as whole. In other words, there is a duplication of efforts, which ultimately is a waste of resources. Not to mention, that issue of quality control is paramount. Explain how they benefit from your work and the specialized tools and skills to help them obtain the best information about their prospects. This may be tricky and it’s important not to point fingers since that may sour relations between the department and the gift officers. If timing is an issue, encourage them to reach out to you and explain that you may be able to negotiate when you can get them in their time frame. Do they really need a full profile? Compromise. Explain what you can get them in their time frame. Perhaps a short look at the prospect’s philanthropic giving is what they need to get going. Encourage them to follow up with you for more research after their visit. Of course, it may depend on the research request and situation. You may want to move research on capacity to the top of the queue if the gift officer is going to make an ask. Another possibility is helping to train gift officers and/or their admins on very straightforward tasks. You can show people how to set up Google alerts on their prospects. Or talk about reliable research methods that aren’t too complicated. You could even review the research quickly for quality control. At one organization, the research and prospect management department had Research 101 to help with the easy asks. You can talk about how to judge data quality and sources and when it’s time to bring in the big guns (ahem... research). However, this will require follow up with individuals to ensure that best practices are maintained but may pay off in the long run in your working relationship with the gift officers and their staff. Unfortunately, you may not be able to persuade your colleagues to stop asking for research outside of your department. In this case, you may want to document incidents and note any repercussions. Be clear in what steps you took to try to resolve issues that came out of extra-departmental research. You may want to consider approaching the head of fundraising to explain the issue and how it impacts the organization as a whole. Explain your proposed solutions to ensure that there is buy-in from the top. Explain the possible strategies you’ve come up with to help resolve the issue. Brock Silvey is Director of Prospect Research and Management at Northwestern University. He is a past APRA-IL board member and a current APRA International board member. Silvey: I received my Bachelors and Masters degrees in English from Northern Illinois University. I entered the professional world without a clear career path in mind, but I felt like I had many translatable skills. Though my first job out of college was not one that turned into a career, I learned many soft skills that taught me how to function in a professional environment. Then I saw an open Assistant Director of Research job at Northwestern and applied, without an understanding of what development research even was and with little expectation that I would be hired for it. However, I got the position and have been at NU ever since, finding ways to grow within the organization to my present role. Now the world of development feels like the career I was always meant to be in. Silvey: I am always improving processes that I think can be better. I have to make sure that I’m not getting complacent. I’m excited by the idea of prospect development teams becoming more integrated into the fundraising strategy development process. Though I am not a fundraiser, there is no reason why I can’t think like one and let that perspective inform how I manage my team. Silvey: I thought about this question from the perspective of a hiring manager, and the qualities that I think set people up for success in the work place. I believe these qualities have particular relevance for people in our field: be flexible, be comfortable with an element of ambiguity, let yourself be okay with not always knowing the answer, but have the curiosity to seek out the answer. APRA-IL: Could you tell us one perception people have about professionals in prospect development? What’s the truth? Silvey: Many people in our field would probably define themselves as introverts, but I think there’s a misperception outside of our field about what that term means. People sometimes assume that introverts are uncomfortable with interpersonal communication and therefore have limited potential to grow into leadership positions. I would describe myself as an introvert, but what that means for me is that I simply need some alone time in order to recharge. I still thrive on collaborating and strategizing, and I want a seat at the table. On the afternoon of Friday, September 30th, 2016 APRA-IL members, new members, and guests gathered at Northwestern University’s John Evans Center for this year’s APRA-IL Fall Conference. Significantly, this conference was formatted as a networking event, and consisted of a discussion panel and track sessions. The day began with a social hour as people trickled into the building. Conversations buzzed through the air as professionals connected with one another about their positions, APRA, prospecting ideas, and more. Following APRA-IL’s President, Katie Ingrao’s welcoming statements, the Vice President, Jessica Szadziewicz hosted development officers panel that allowed Prospect Development professionals insight on what these officers, and perhaps gift officers in general, value from researchers. Attendees learned that to make an ask it was helpful to know the prospect’s interests, other places prospects have given to, and relevant relationships, in addition to of course wealth capacities. This panel was an educational piece of the event, and added transparency and comfort to ask questions. Track sessions in Prospect Research, Prospect Management, and Data Analytics had preconceived topics, and there was time allotted to switching topics within a session. The round table set up for the Prospect Research room was an amazing touch to the intimacy and ability to freely exchange ideas. Professionals really wanted to learn from eachother, and hear one another’s research and management stories. After the conference, many attendees walked over in groups to enjoy Happy Hour at the local beer tavern, World of Beer. Overall, the conference encouraged me to re-evaluate first what development and gift officers were receiving from researchers, how I communicated Prospect research to internal and external professionals, and finally how important it was to attend events like this because I needed to hear the exchange of new vendors that people were considering or using. I believe events like this truly allow you to surround yourself with fresh ideas. Thank you APRA-IL for the space, time to learn, and opportunity to meet new people with common interests. Congratulations on another successful event!